They’ve just got to stay out of trouble. Jackson, who was suspended for last season’s Pinstripe Bowl for breaking team rules, will miss his second straight game on Sept. 1 against Northern Illinois for what coach Kirk Ferentz said was a violation of team policy. Wirfs won’t play against the Huskies either after being charged with drunk driving on July 29. Defensive tackles Brady Reiff (public intoxication) and Cedrick Lattimore (team rules) will also be suspended for the opener. But Ferentz said Friday at the team’s annual media day that he’s optimistic that each of those four incidents will wind up being “a blip on the radar” as far as those player’s careers are concerned. Every team in America says it prides itself on being physical up front. But it’s a special emphasis at Iowa, which has sent scores of linemen to the NFL under Ferentz, a longtime line coach with Cleveland and Baltimore. The Hawkeyes will likely struggle unless Jackson and Wirfs — who got unexpectedly early playing time in 2017 after injuries to since-departed seniors Boone Myers and Ike Boettger — stay healthy and in the coaching staff’s good graces. Jackson, who is listed at 6-foot-7 and 320 pounds, was the only Iowa lineman to start all 12 regular season games at the same spot, left tackle, a year ago. Jackson is considered raw but with plenty of potential, and the fact that Ferentz felt comfortable enough to put him in charge of protecting quarterback Nate Stanley’s blind side in his first season spoke volumes of how much the staff thinks of his potential. “It’s like any player on our football team. 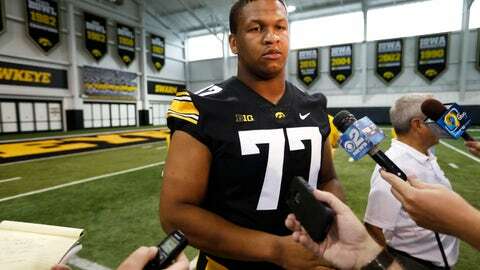 Everybody has got a resume that they’re building, and they’re either adding to it or taking away from it,” Ferentz said. “I think Alaric is a tremendous young man, and I’m very hopeful that he’s going to have a great career here,” Ferentz said. Wirfs is perhaps the most promising lineman the Hawkeyes have landed from their own state in quite some time. The 6-foot-5, 320-pound Wirfs did it all for nearby Mount Vernon High, winning state titles in wrestling, shot put and the discus in addition to leading the football team to the state championship game. Last season Wirfs became the first true freshman to ever start at tackle for Ferentz, and he was one of just two newcomers to land on the team’s vaunted leadership group.